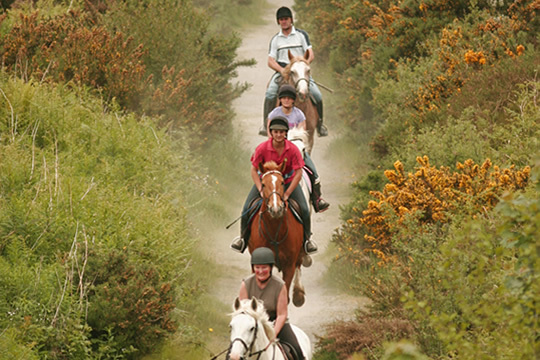 Laketour Stables, run by the Flavin family, Pat, Carmel, John, Debbie and Patrick, is situated in the most scenic location for trekking in the South East. With a superb reputation, riders return week after week and year after year. We are conveniently located just a mile from Ballyscanlon and Carrigavantry lakes and a mile from Tramore Beach, one of the finest beaches in Ireland. Laketour Stables is the premier equestrian centre in the South East. We have outstanding facilities including an indoor arena, cross country course, sand gallops, track to lake for trekking. Our staff have many years of experience and their attention to detail is exceptional. We take great care when picking our horses and ponies to ensure that their temperament and suitability for lessons and trekking will ensure a pleasurable experience for riders from beginner to advanced.